Coach Johnson is the founder and Executive Director of Barnstormers Basketball and also the owner of Elite Sports, USA. Through Elite Sports, Jamie organizes basketball events throughout Iowa, including spring individual “Showcases”, and team tournaments. 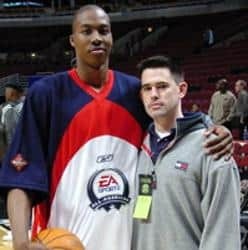 Prior to coaching with the Barnstormers, Jamie assisted in the operation of events for FutureStars Basketball, while also working as a national talent scout and recruiting analyst. Through his experience in scouting, coach Johnson has developed relationships with countless college coaches at a variety of playing levels. He has also written for online publications like Hoopmasters.com, and Rivals.com, among others. Jamie is a graduate of the University of Iowa, with a degree in Media. Jamie is an administrator at the VA Hospital in Iowa City, and lives in Solon with his wife, Makenzie and three boys, Drayden, Logan and Landon. Jamie organizes hosted events for the Barnstormers, and maintains control of the logistical functions as well as player selection, travel, and sponsorships. He assists at all of the high school age groups. Coach Pettigrew joined the ‘Stormers in 2008 after spending 3 years as the founder/director of the Iowa Triple Threat Hoops AAU program. In addition to his coaching duties with the Barnstormers, Coach Pettigrew also organizes individual workouts for players in the fall and spring, and spends countless hours organizing and directing the Barnstormers fundraising efforts for families who need extra support. Jamie is a graduate of the University of Iowa with a bachelors degree in Sports Management. He lives in Cedar Rapids with his wife Annie and is a proud father of five; including two boys who played for the Barnstormers (Alex Coleman, 2006-2009 and Jo Coleman, 2007-2011). Coach Pettigrew will coach the 10th grade boys for the 2017-2018 season. Coach Schmitt played collegiate basketball at Clarke University, until he began coaching at Dubuque Senior High School as an assistant. In 2004 and 2005, Coach Schmitt directed and coached the Iowa Magic AAU program, before leaving to accept an assistant coaching position at Loras College in 2006. In his six seasons with the Duhawks, they amassed a record of 102-59, winning two Iowa Conference championships and making it to the NCAA Division III tournament twice. Coach Schmitt is an Assistant Superintendent of Greens at the Dubuque Golf and Country Club in Dubuque, Iowa where he also resides with his wife Alicia, and son Chandler. 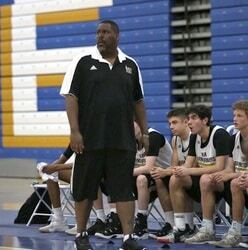 Coach Schmitt coached the 2018 group for seven years, leading them to Final 4 finishes at the adidas Gauntlet Finale twice (2016 and 2017), winning the championship at the Spiece Run ‘N Slam in 2015 and 2016, and getting them to the finals of the adidas Summer Championships in 2016. Tanner was the Director of Sauk Valley Magic for 8+ years and was also the 17U Elite Coach. He is also the Head Boys Varsity Basketball Coach at Central City High School. Tanner scored over 2,000 career high school points (Annawan High School and Lincoln Trail Conference’s career points record holder), and was named All-State 3 years. 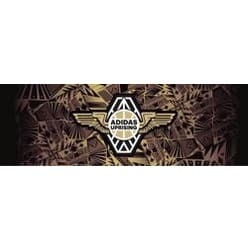 He played college basketball at the University of Wisconsin-Platteville and Knox College. He was awarded All-Conference recognition for 2 years as a Point Guard for Knox College. Coach Kelly is in his sixth year as a member of the Barnstormers coaching staff. This season, Coach Kelly will lead our 11th Grade Silver team. Ryan has worked for several years in skill development with Dubuque area athlete, and is currently the assistant varsity Basketball coach at Iowa City Liberty High School. 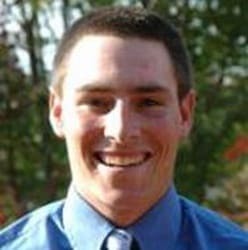 Ryan graduated from Clarke University with a major in Math and Education, where he was a standout on the Clarke College Baseball team. Originally from the south side of Chicago, Ryan currently lives in North Liberty where he is a math teacher at Liberty High School. 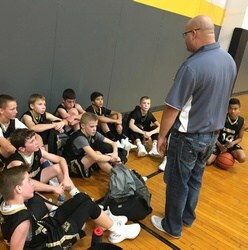 Coach Barnes joined the Barnstormers staff in 2014-15, coaching our Class of 2022 during their first year in the program. He’ll continue to work with that class for a fourth year as our top 8th grade head coach again this season, as well as assisting with several of the older age groups. In his first year with the ‘Stormers, Coach Barnes coached our Class of 2019 group in the prestigious Nike 8th Grade Finale in Augusta, Georgia. Val played high school basketball at Wichita South, and was named “Mr. Basketball” in Kansas in 1989. He spent one year at Butler County Community College before transferring and playing three years at the University of Iowa. Val was named an All-Big 10 basketball player during his career at the University of Iowa, playing for Dr. Tom Davis. Val resides in Coralville with his sons Canaan, Christian, and Kolbie. Coach Adams enters his second year coaching with the Barnstormers. TJ has spent his entire life on the basketball court, where his mother was a high school basketball coach and his father was a high school and semi-pro official. TJ attended high school in Colorado at Silver Creek High School, earning six varsity letters in football and basketball, earning first-team all-conference and all-state recognition. TJ was part of the Colorado Chaos club, playing on their top teams through middle school and high school, and played college basketball in Minnesota. 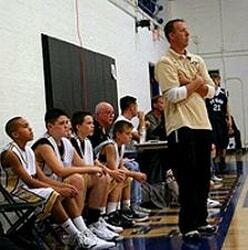 TJ began coaching right after high school with the Chaos basketball club, spending four years on their staff. He was the youngest coach to reach 100 wins, and holds their single-season wins record with 53 in 2015. In addition to coaching with the Chaos, TJ served as a varsity assistant and JV coach at at Silver Creek High School. TJ lives in and works for the City of Cedar Rapids. Coach Martin is excited about his first year with the Barnstormers. He will be assisting with his son Brady’s 6th grade team. Tracy has been coaching his son’s local travel teams for the last 15 years in USSSA baseball & 4 years in AAU Basketball leading both local programs to multiple State Championships over the years. Tracy played high school basketball at Notre Dame Catholic High School in Burlington and attended an apprenticeship program that led him to his career as an IBEW Electrician. He lives in Burlington with his wife Jenny and his 3 boys Trevor, Taylor, and Brady.